We regularly receive the question whether a dog should wear a dog winter coat when it gets colder outside. Of course, there are several reasons why your dog should wear a coat. One reason is the use of a dog coat as a fashion accessory. A perhaps more important reason is the functionality a dog coat can provide. Always make sure to buy a dog coat that has high quality fabrics, such as those from Hurtta and Ruffwear. A dog coat can be used as protection against rain, wind and cold weather. 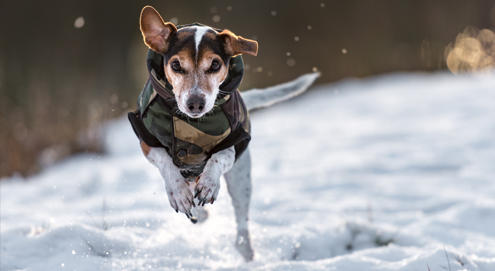 Is a dog coat really necessary for weather conditions? Fortunately, cold weather in the United Kingdom is not the most extreme. Most dogs have sufficient protection against the cold thanks to their fur. The use of a dog coat is often discouraged, as your dog's coat could not adapt to the colder weather in the UK. But there are always exceptions where the use of a dog coat is recommended. When should my dog wear a coat? Some dog breeds have a very short coat or very thin fur, so you can expect them to get cold faster. For example, think of the (Spanish) greyhounds, boxers and the French Bulldog. Old and sick dogs often have a coat of inferior quality. They often have a thinner coat and can therefore be more susceptible to cold. Dogs that have just come to the UK from warmer countries. Think for example of adopted dogs from for example Greece or Spain. These dogs are not used to the colder climate in the UK and their coats have not yet had time to adapt to the new weather conditions. Pups have a different coat than adult dogs. This coat is often also less adapted to a cold and wet climate. Dogs with skin problems often have poor quality coats, which makes them more vulnerable to cold temperatures. Staying in cold outside weather for a longer term period, for example during winter sports or hunting training where the dog also swims and has to sit still regularly. Does my dog need to wear a coat when it rains? Your dog's coat is basically the best protection that it can have against the rain. In most cases, a dog raincoat is not necessary. Only when problems exist with the coat of your dog can a raincoat be required. Naturally, a dog raincoat can offer protection against dirt and humidity. This is convenient if you do not feel like washing or drying your dog with a towel after walks. Does my large dog require a dog coat? The size of your dog does not determine the need for a dog coat. As mentioned above, it is in particular the health condition, type of fur and how you clean your dog that determine if a coat is really necessary. Are you taking your dog with you during a winter holiday? Are you taking your dog with you during a long hike outside in cold temperatures where your dog has to sit, swim or stand still for a longer period of time? In these cases, a dog coat can be very useful. [p]A dog coat can be a solution to make your dog more visible in the dark. Special reflective dog collars are available, but the reflectors that are applied to most dog coats certainly contribute to the visibility of your dog during night time. What kind of dog coats are available? There are many different dog coats. The coat range varies from fleece dog coats to thermal dog coats, water repellent dog coats, windproof dog coats and rain coats. Not all dogs need a dog coat or jacket. The danger even exists that your dog can overheat when you misuse a dog coat. Sometimes people think that a dog feels cold if he is shivering. However, dogs can also shiver by a certain degree of excitement or fear. This is why you should always think twice whether or not your dog requires a dog coat before purchasing. Under normal circumstances a dog coat is not necessary. However, in the aforementioned cases where your dog does benefit from wearing a dog coat, it is a wise decision to order one online. Vetsend offers a wide range of dog coats. If you are unsure whether your dog should wear a coat, please contact us by phone or via veterinarian@vetsend.co.uk. A comfortable raincoat for dogs. With adjustable belt and elastic band for back length. Cheerful waterproof dog coat with removable fleece lining. Insulated autumn & winter jacket with zipper.